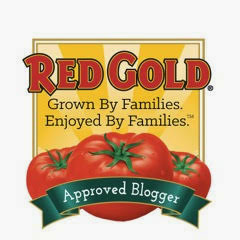 The Weekend Gourmet: A Food Lover's Weekend in New Orleans Part 3...Plus an Aunt Sally's Pralines Giveaway!! 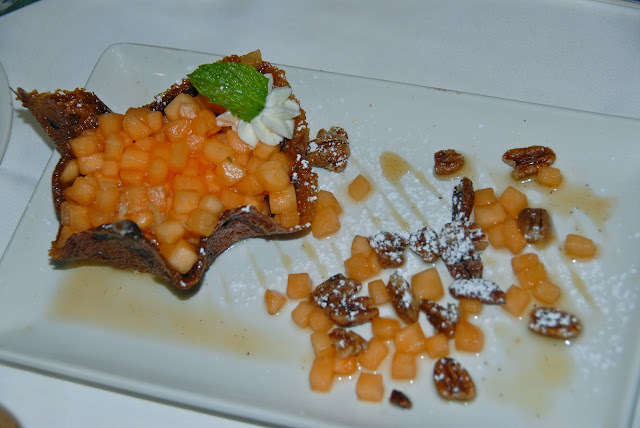 A Food Lover's Weekend in New Orleans Part 3...Plus an Aunt Sally's Pralines Giveaway!! you know you're in for a fabulous experience! 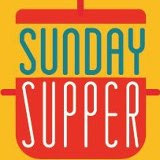 We woke up on the Sunday of our Food Lover's Weekend to more rain...buckets of it! It may have been damp in New Orleans that weekend, but we didn't let it dampen our spirits. Thanks to some sturdy umbrellas and a rental car, we were able to stay pretty dry as we went from one destination to the next. We would be saying goodbye to New Orleans later that afternoon...but not until we had Sunday Jazz Brunch at one of the city's landmark restaurants: Commander's Palace. No visit to New Orleans is truly complete until you experience this mixture of jazz music, delicious food, and pampering service! signature house-made garlic bread, and peach gazpacho. Commander's Palace is located in a turquoise two-story home in the Garden District, an easy 15-minute drive from the French Quarter. If you have more time, you can also take the St. Charles Avenue streetcar and enjoy the wonderful architecture of the homes in the neighborhood. We were immediately seated and brought a variety of eye-openers: kir royal, mimosa, and brandy milk punch...along with fresh-from-the-oven garlic bread and a shotglass of peach gazpacho. 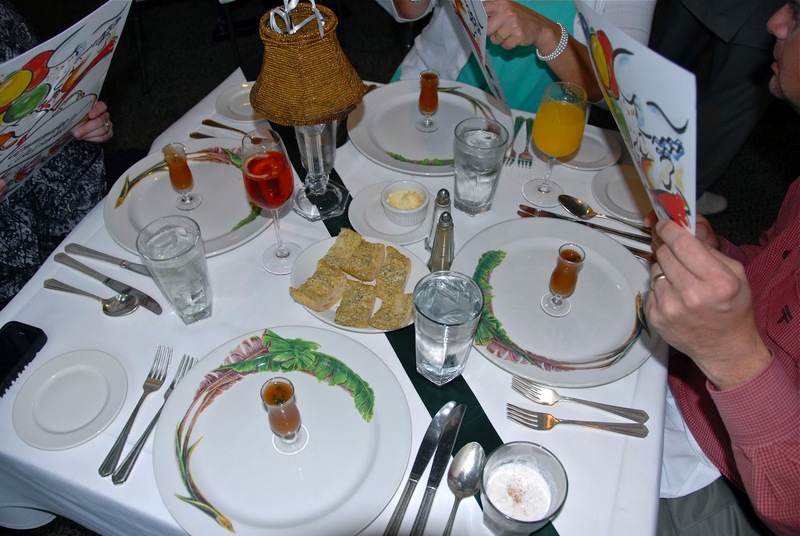 It was a very tasty way to get things started as we looked over the prix fixe brunch menu. 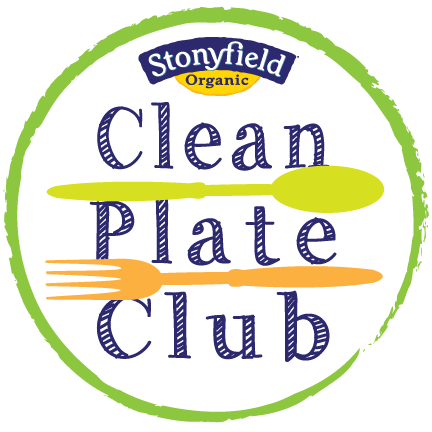 The price of your entree includes an appetizer and dessert, making this a great value! The food was excellent, starting with the appetizers. The guys had Commander's excellent Creole gumbo, Crystal (social media guru extraordinaire) had a tuile cookie filled with sweetened Creole cream cheese and topped with sweet diced cantaloupe. I adore shrimp remoulade, so I gave theirs a try: the shrimp were plump and sweet, and the remoulade had a perfect punch! cantaloupe. Add in some vanilla bean-infused syrup and candied pecans, and you've got a winner! 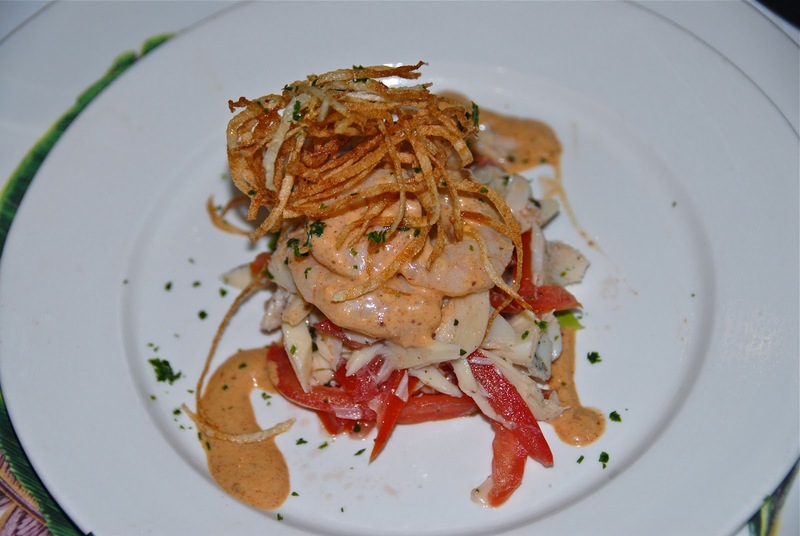 A savory appetizer: Louisiana shrimp served with spicy remoulade sauce. Next came the entrees. 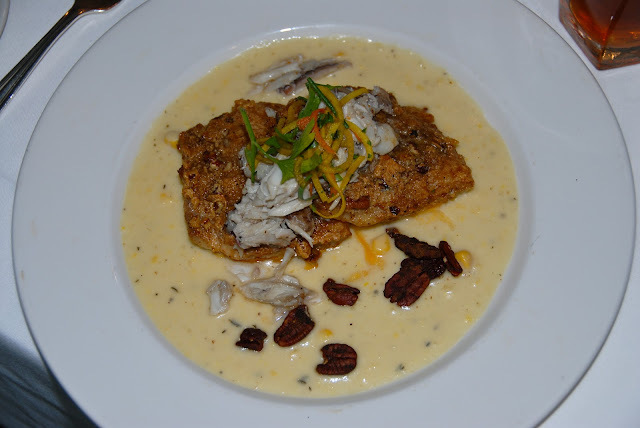 First up was the Pecan Crusted Gulf Fish with Prosecco Poached Crabmeat, Spiced Pecans, and Crushed Corn Sauce. We also tried the Barbeque Shrimp with Andouille Cracked Corn Grits and Abita Beer Barbeque Sauce. The fish was moist, spicy, and nutty...and the crabmeat provided a nice sweet counterbalance. The shrimp were plump in a spicy sauce...and the grits were earthy and spicy from the chunks of sausage. Pecan-crusted Gulf fish topped with lump crabmeat...served in a pool of crushed corn sauce. 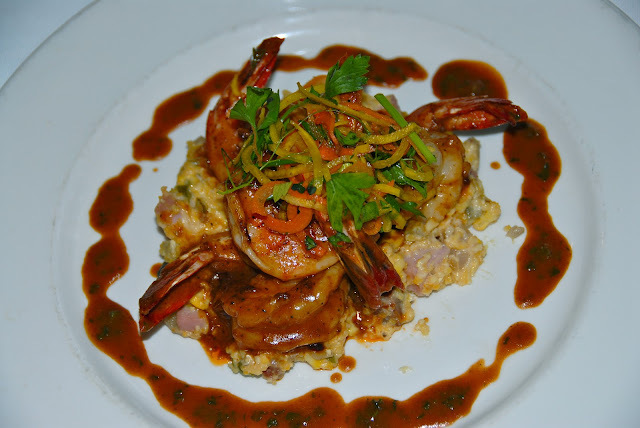 A spicy entree: Seared shrimp in Abita beer barbeque sauce, served over andouille-spiked grits. Between the entrees and the dessert course, the strolling jazz combo stopped by our table to play a New Orleans standard. It was great fun...and everyone in the dining room was clapping and enjoying it as much as we were! Before we knew it, dessert arrived. 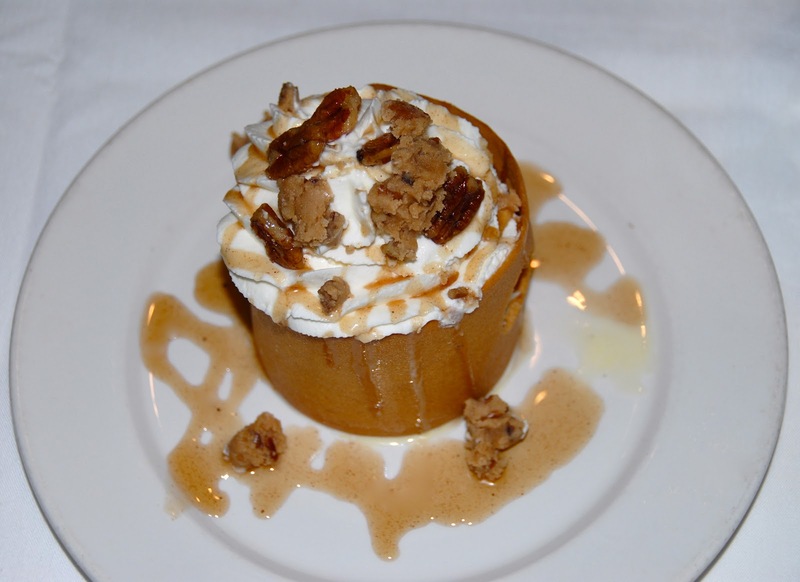 My two favorites were their signature Creole Bread Pudding Souffle with Whiskey Sauce and the Praline Parfait. 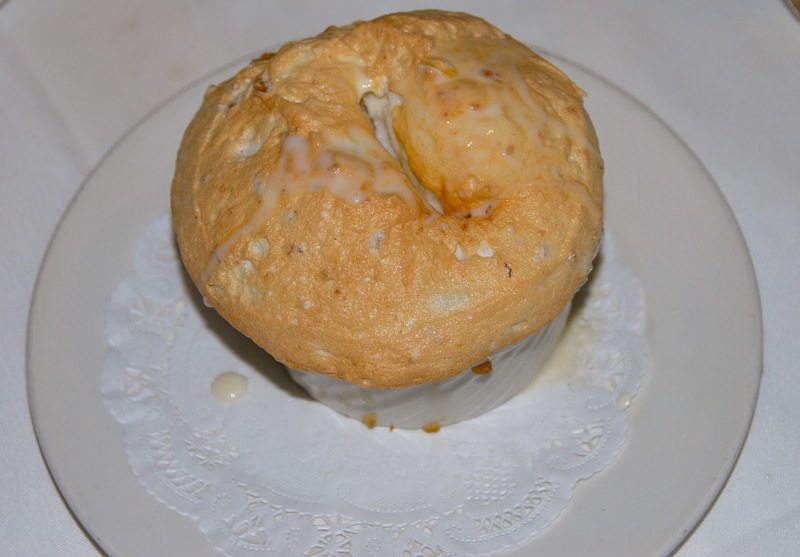 The souffle takes a down-home favorite and elevates it to gourmet status...fluffy, rich, and sinful (in the best way possible)!! The parfait was almost too pretty to eat: vanilla bean ice cream layered with house-made pralines, whipped cream, and candied pecans...wrapped in a honey tuile and topped with sticky praline sauce. Praline parfait...sweet, but not overly rich! Pralines, vanilla bean ice cream, and whipped cream. Encased in a crunchy honey tuile cookie and topped with candied almonds and caramel sauce. The Weekend Gourmet crew is all smiles as we enjoy Sunday Jazz Brunch. 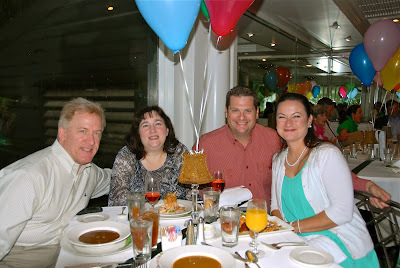 As you can see from the smiles on our faces, the four of us had a fantastic time at Sunday Jazz Brunch! It was the perfect way to end a wonderful weekend of dining in one of the nation's best culinary cities! It was nearly time to hit the road to head back to Texas, but not before heading back to our cottage at The Audubon Cottages to tell Roderick goodbye and snap a few last pictures of the property. We loaded up the car and headed out of town...but not before one last stop for one last order of beignets at Cafe du Monde and a souvenir stop at The French Market! We enjoyed some fabulous meals during the weekend...and a few sweet treats in between meals too. Before I conclude this article, I have to tell you about some of the very best sweet treats that the city has to offer! One of the very best bakeries in New Orleans is Sucre. I've partnered with them for reviews and giveaways twice before, so I was excited to finally get to visit them in person! They have two locations, but we visited the Magazine Street location. They offer gelato, handmade chocolates, and exquisite pastries and cookies made by Chef Tariq Hanna. While we were in the store, we tried some of the fabulous sorbet: strawberry sorbet and coconut basil sorbet. The strawberry tasted exactly like a fresh strawberry, but the coconut basil lime was sublime and downright addictive! They also sent a huge bag of goodies with us that included their addictive macarons, huge dark chocolate caramel cookies, a few of their mini cake entremets, and their New Orleans Chocolate Collection. Everything they sent with us was fabulous! We especially enjoyed the White Chocolate Bread Pudding and the Turtle: chocolate bread pudding topped chocolate mousse, salted caramel mousse, and a hidden gem! Both were decadent, and the small portion size made them not overly rich. The chocolate collection included flavors that were reminiscent of New Orleans. White Chocolate Bread Pudding from Sucre...good warm or at room temperature! The Turtle: layers of chocolate and caramel mousse topped with ganache and a candied pecan. bananas foster, and a fleur-de-lis-shaped chocolate ganache. Italian ice cream and baked goods at Angelo Brocato. While researching restaurants for this article, I learned about favorite bakery of New Orleans locals: Angelo Brocato. 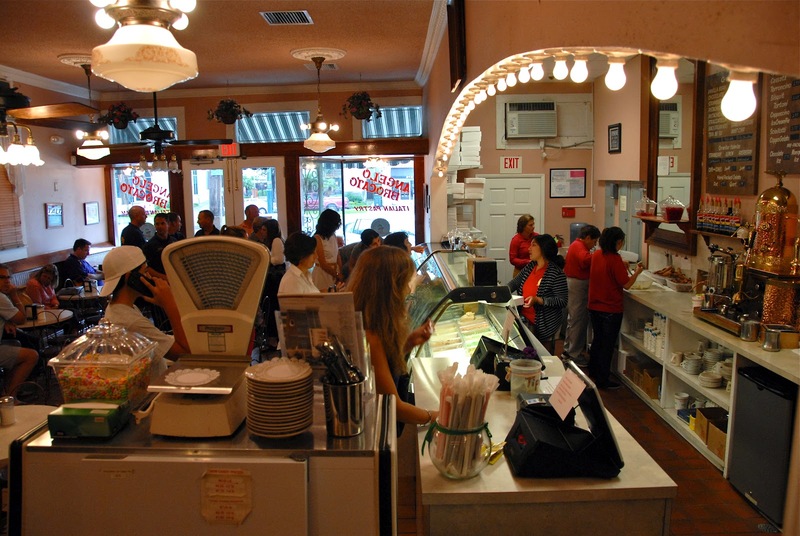 This place is a New Orleans legend, serving authentic Italian ice cream and baked goods since 1905. To last that long, you have to do what you do very well! We pulled up and found a line out the door on Sunday afternoon. People I talked with while waiting my turn told be about coming with their parents and grandparents as kids...and that now they bring their kids for goodies! They boxed up a sampling of their signature Italian cookies for us to try, including fresh-made mini cannoli, biscotti, pine nut cookies, and Italian fig cookies. The cannoli filling was lightly sweet and perfectly creamy, and it contrasted nicely against the crispy shell. They are assembled by hand as you wait, so they're fresh as can be! The fig cookies were fabulous, as were the round biscotti. A sampling of cannoli and Italian cookies from Angelo Brocato. After a visit to Cafe du Monde to have some beignets and cafe au lait, why not up the sugar factor a bit more by walking toward the French Market and right into Aunt Sally's Pralines! Please make sure to pronounce it the correct southern way, though: prah-leen! 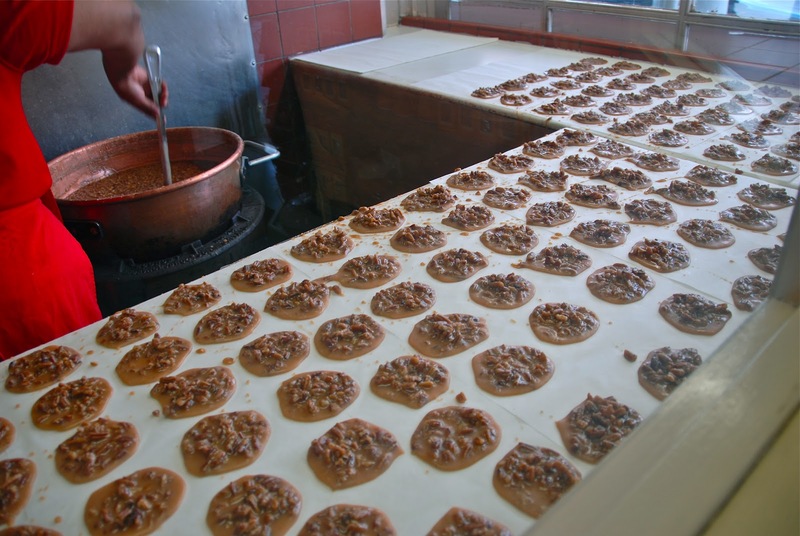 There are many praline makers in New Orleans, but Aunt Sally's is my personal favorite. Their pralines are full of tender pecans, and you can watch them being made by hand in a copper pot in the kitchen. It's fascinating to watch the mixture bubble away in a copper pot, then be placed in rounds to cool on the counter. They even offer samples so you can try before you buy! Pralines bubbling away in a well-used copper pot...in the kitchen at Aunt Sally's Pralines. 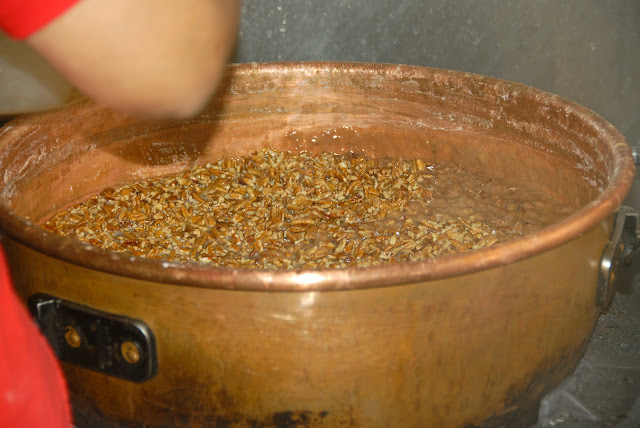 pot makes approximately 300 pralines. 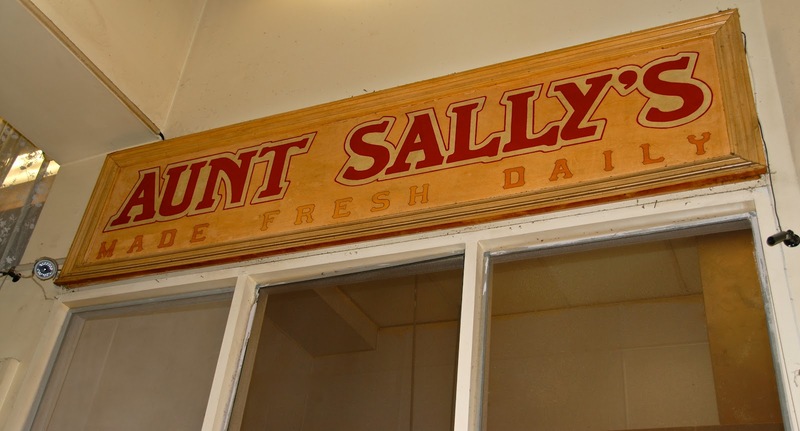 In business since the 1930s, Aunt Sally's offers a wide variety of pralines, including traditional Creole, creamy, and chewy. They also come in several flavors, including original pecan, triple chocolate, bananas foster, and even a spicy one flavored with a bit of Louisiana Tabasco sauce! Even better, Aunt Sally's is going to give one of my readers a 12-pack of their Creole pralines: six each of Original and Triple Chocolate! To enter the giveaway, simply leave a comment below telling me how you might use Aunt Sally's pralines in your kitchen...or if you plain to enjoy them straight from the box "as is." 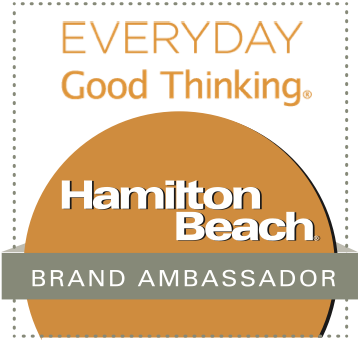 Make sure to leave your e-mail so I can contact you if you win. I will accept entries until this Friday, September 21st, and the winner will be notified this weekend. I hope that you enjoyed reading about our Food Lover's Weekend in New Orleans...and that you'll plan a trip to visit New Orleans very soon and see for yourself why we love it so much! The city has so much to offer: fabulous food, friendly people, a rich history, and lots of amazing architecture. It's the perfect long weekend getaway, especially from Texas! Most major airlines fly into the New Orleans airport, and it's easy to catch a shuttle to French Quarter hotels. Special thanks to the nice folks at the New Orleans Convention and Visitors Bureau for hosting our trip and arranging all of our meal reservations for us. I would have to eat them just straight from the box. My stepfather was Cajun and I haven't had a good Praline since he passed away years ago. Took me a good 10 minutes to type. Was too busy drooling. If my husband is lucky, I would share those bits of heavenly deliciousness with him. Maybe. I'd at least consider it while I was enjoying them. And may I just say, I have LOOOOVED your trip! I felt like I went with you! I probably couldn't resist eating them straight from the box! It's been years since I've gotten pralines at Aunt Sally's; this makes me want to go back soon!